Keeping your pet looking good isn’t as easy as one may think. There are lots that need to be done. You must keep their nails short. You must ensure they’re well fed and this impacts on their look. And, of course, their fur needs to be kept short and neat. All these require patience. This is patience that neither you nor your pet has. But these are tasks that must be done. Clipping your pet’s fur is not a job for the faint-hearted. There have always been professionals, well-versed in the art of keeping pets still long enough to get their entire body well groomed. These professionals have always seemed like miracle workers- until now. The growth of the pets market has seen the development of devices that will turn even the most novice of pet owners into a professional groomer. One such device is the electric pet clippers. Just like the human hair clippers, these units get your pets’ fur clipped in no time at all. And you’ll be able to get this done all by yourself. So, what makes the best dog grooming clipper? The main thing you should be looking at is the blade. This is the part that determines whether the task will be a painful experience or enjoyable one for both you and your pet. Make sure the blade comes sharp right out of the box. The material is made of will determine how long it maintains its sharp edge. Titanium blades are the best. There are clippers that have a self-sharpening technology. This continuously sharpens the blade as you use it ensuring that you don’t have to worry about it losing its edge. They are, of course, more costly. Also, the motor of the blade needs to be one that doesn’t make too much noise. The louder it is, the more anxious your pet will get. The best ones have very low noise levels of just 50db. It should also have a low vibration. The point of all this is so as to keep your dog relaxed throughout the shaving exercise. That said, I’m sure you’re wondering where to start searching for the best dog clippers, right? Worry no more because we’ve done the search for you. We’ve put together a list of the best electric clippers you can find with features that are almost similar. The Maxshop Clippers opens our reviews, with this excellent product. It’s a compact and lightweight device that fits snugly in your hand. Carrying it, you’ll notice how weightless it is. Weighing in at just 650 grams and with dimensions of 10.7 inches by 2.4 inches by 8.1 inches, the Maxshop scores major points in portability. The blade is crafted with strength in mind. It is made of high-quality stainless steel which grants it high durability. 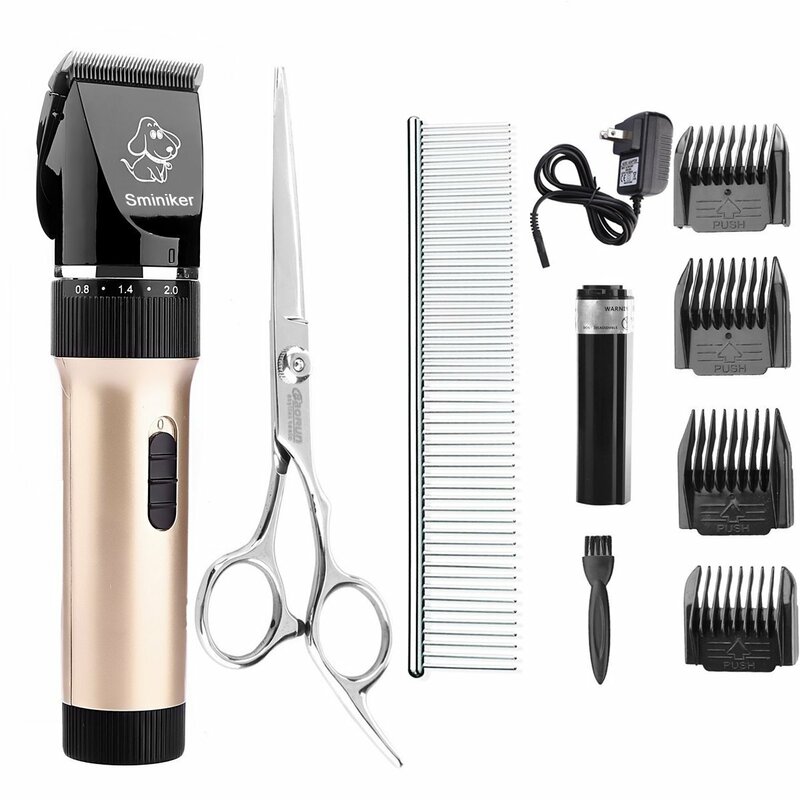 Whether your pet has long and thick hair or short and light, the Clippers will handle the task with ease. Under the hood is Maxshop’s chief selling point; the silent motor. And it truly does produce very little sound when in action. With sounds of just 50 dB, this device won’t startle your pet at all. However, the silence doesn’t mean a lack of power. This motor can handle heavy tasks without breaking a sweat. Working in tandem with the blade, grooming your pet is made much easier. Powering the Clippers is a rechargeable battery which fills up in five hours. This should give you about 70 minutes of continuous use. And with the 4 guide combs, you’ll be able to get your pet looking great in no time. Coming in next is these professional pet clippers from Sminiker Professional. This is a highly portable device with a net weight of just 1.3 pounds. And with dimensions of just 9.7 inches by 9.3 inches by 2.7 inches, the Sminiker will fit perfectly in your hand, allowing you to hold it for prolonged periods at a time. It comes in two adorable colors; Gold and Dark Red. Both of these present similar features, meant to ease the dog grooming process. Within it, there’s a heavy duty gear which powerfully rotates to bring life to the titanium blade. This gear is built to handle intense hair clipping work without heating. But this isn’t why this motor is one of the best. What makes it wonderful is the fact that it remains quiet when in operation. This prevents your animals from getting startled by its sound. Made of titanium, the fixed blade is sharp, strong and highly durable. Working in combination with this is the ceramic movable blade. The materials used are rust resistant and retain their sharp edge for a long time. Then, to complement the work of the blades, you also get four different guide combs in the package allowing you to safely trim your pets. With the rechargeable battery that powers the Sminiker, the device works for 5 to 6 hours after charging for just 3 to 4 hours. 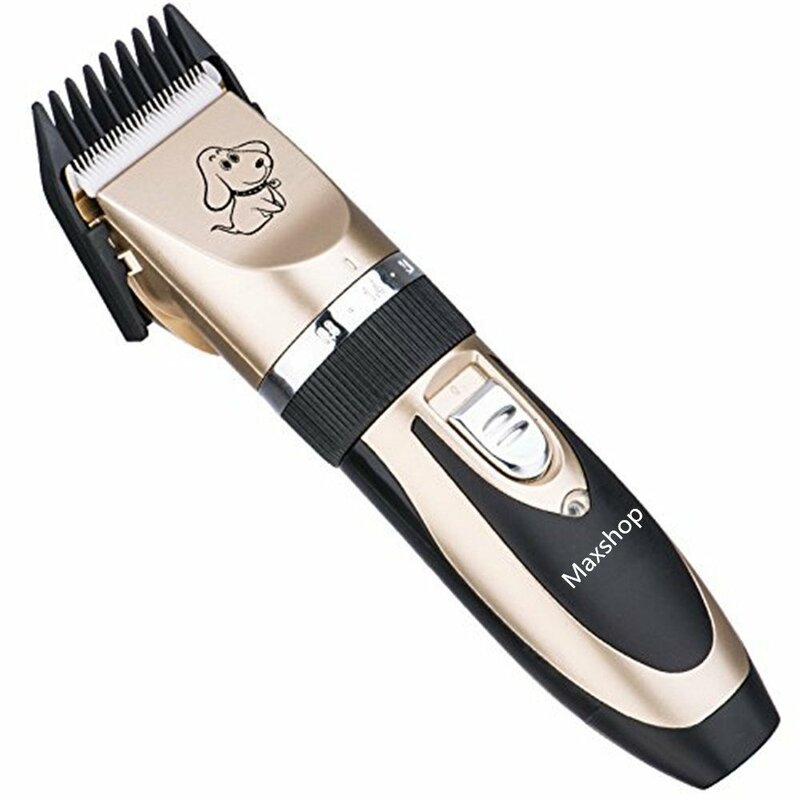 Finding its spot in our list of the best dog clippers is the Cropal. And this device carries on the tried and true design of seen in other clippers. The blade sticks out of the rest of the body at an angle which prevents it from cutting into your dog’s skin. Made of ceramic, this blade is resistant to rust and heavy use. And because it comes you sharp, right out of the box, this edge is maintained for a long time so you don’t have to worry about sharpening it. To complement this, you also get two replaceable attachment guide combs which are easy to use and comfortable for your pets. Driving the blade is a silent running motor. It’s unbelievably quiet when running, producing just 50 dB of noise. Therefore, your pets are kept calm while you shave them. The sound might even lull them to sleep. Powering the motor is a high capacity rechargeable Li-battery. To fill it up, simply plug in the unit for about one and a half hours. When full, the battery will provide up to 100 minutes of continuous use. Bojafa joins its counterparts in the list as one of the best dog grooming clippers. And it certainly deserves it as this unit is packed with great specifications that ease the burden of pet grooming. The blade, being the Clippers’ weapon of choice is sharp and strong. Made of titanium, this fixed blade easily glides through pets’ fur. Backing it up is a movable ceramic blade which ensures your work is neat and as painless as possible. Then, to give the shaving a professional touch, the Bojafa also comes with a set of detachable blades which are easy to replace. Still, the device also comes with four guide combs that complement the work done by the blades. The Bojafa isn’t left behind when it comes to a silent yet powerful motor. Just like its counterparts, this motor runs in total silence, producing a sound that only reaches 50 dB. Thanks to this advancement, pets no longer have a reason to fear getting their fur clipped. The motor also provides a very low amount of vibration. Giving the clippers life is a built-in rechargeable battery. This battery completely charges for five hours and gives 70 minutes of continuous work. However, the device can still be operated when plugged into the mains outlet. Still, Bojafa offers an extra battery in the package. 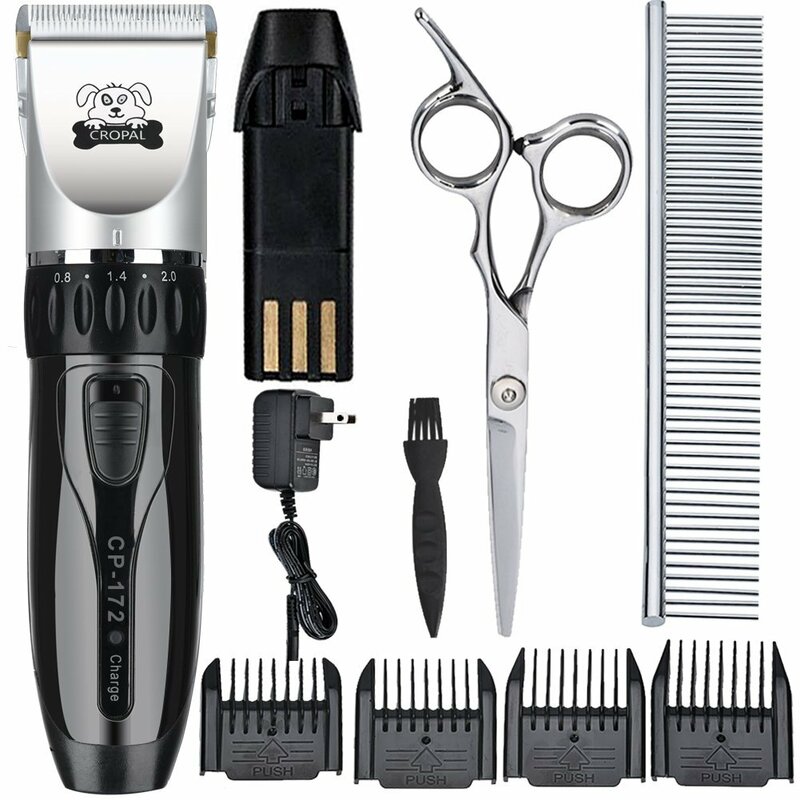 Finally, we have the premium looking Wahl clipper kit. This device has a beautiful design with lovely curves on the sides. This design gives it a comfortable feel in the hand. 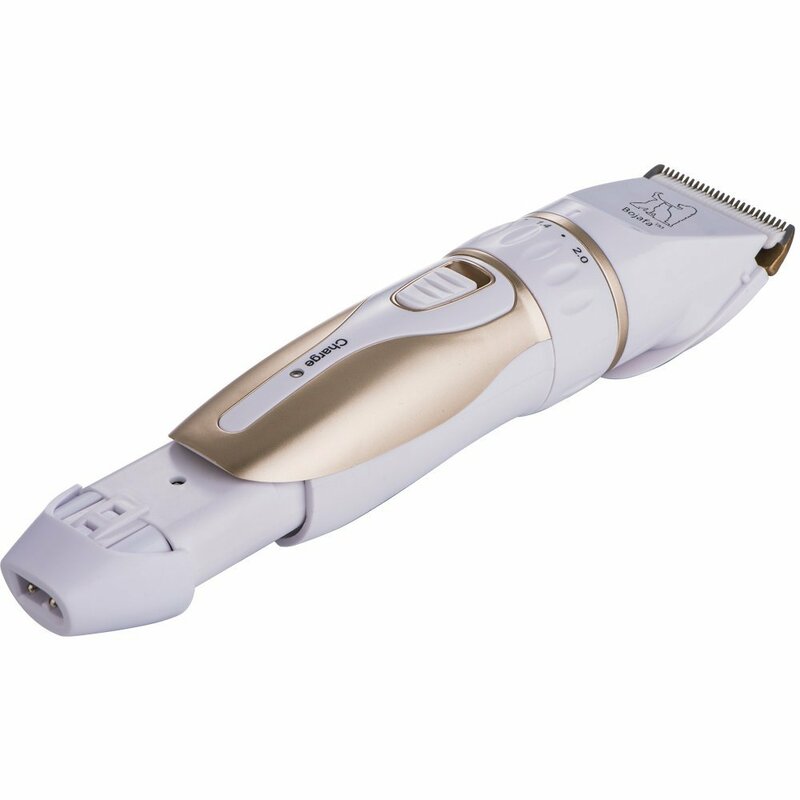 Wahl is known for making more than just adorable shavers and this pet clipper is no exception. It bears strong blades that are self-sharpening. What this means is that at no point will the blades become dull. This clipper is made for heavy work and the strength of the blades proves this fact. Collaborating with the blades is a heavy-duty rotary motor. This powerful motor is hidden within the unit and works in total silence. Its strength enables the Wahl to power right through the thickest and heaviest of coats. Then, to give power to the Wahl there’s a rechargeable Lithium Battery. On a full charge, this battery gives 2 hours of continuous runtime. 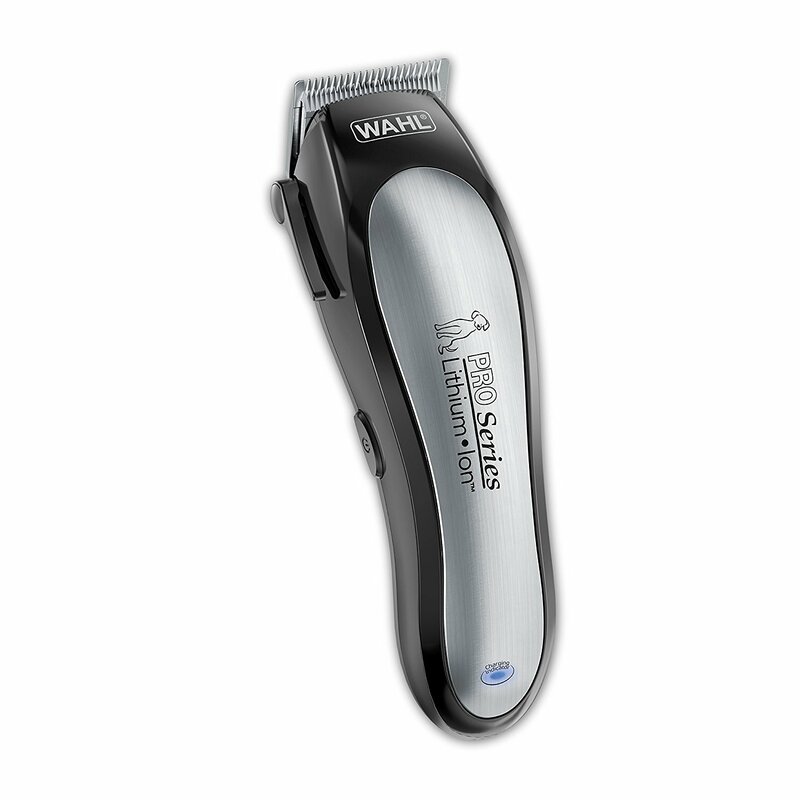 Finally, Wahl gives us the assurance that this is a high-quality product by offering a staggering five years of warranty. These are excellent units that provide efficient, comfortable and neat clipping. Even if it’s your first time grooming your pets, the ease of use of these devices will make you feel like a professional. We do, however, have one that’s a clear favorite. This is the one that makes the grooming process easy, bearing a high-quality blade with a set of guide combs. It has a high capacity rechargeable battery which powers a super silent and vibration free motor. The best dog grooming clipper is the Maxshop Pet Dogs and Cats Electric Clippers.